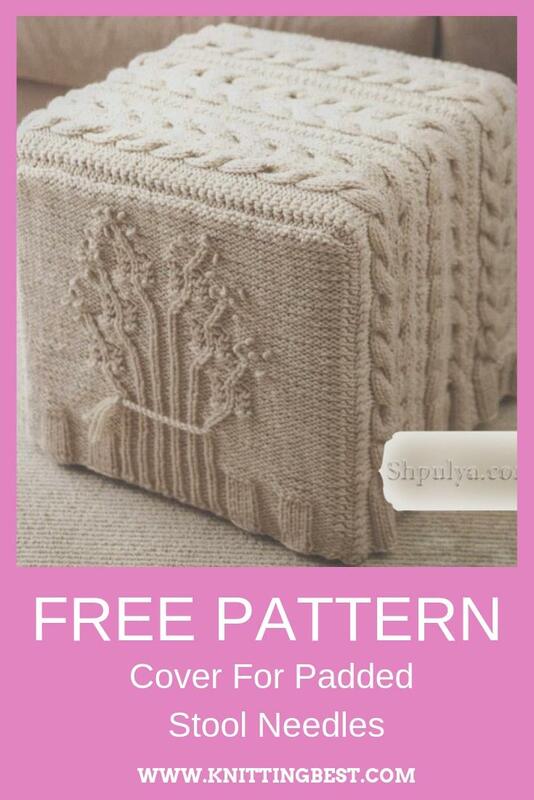 Sizes: on an ottoman cube with a side of 44.5 cm. Materials: 850 g of Red Heart Super Chuncy yarn (100% acrylic, 189 m / 170 g); Needles number 6.5. The case consists of three parts: the central and two side. Twisted stitch. Secure the thread from the inside or under the stitch and bring it to the front side of the canvas. Slightly stepping back, inject a needle into the canvas from right to left and bring it to the first puncture site on the front side. The distance between these two points determines the length of the node. Make 5-6 threads with a working thread on the tip of the needle and, holding the turns of the working thread with the fingers of your left hand, stretch the needle. Then inject a needle into the previous puncture and pull it out next, pulling the thread. The first flagellum turned out. Twisted cord. Cut the thread length of 192 cm. Fold it in half and fasten the ends. Place a pencil in the fold, lightly tighten the threads, hold the threads in one hand, turn the pencil until the threads are doubled and the cord becomes tight. Release the clamped end and allow the cord to spin by inertia. Twist the cord to the end. Secure the second twist and tips, tying knots at a distance of 4 cm from the edges. Trim the tips. LC: enter the needle from back to front between the first and second loops on the left needle, knit the second loop with the loop for the front arc without removing it from the needle, then knit the first loop with the loop for the front arc and remove both loops from the needle. RC: skip the trace, loop on the left knitting needle, knit the second loop of the PI, then knit the first loop of the PI and remove both loops from the knitting needle together. 4/4 LC: remove the trail. 4 p. For additional a knitting needle for work, 4 PL, 4 LP with auxiliary knitting needles. 4/4 RC: remove the trail. 4 p. For additional knitting needle before work, 4 LP, 4 LP with auxiliary knitting needles. 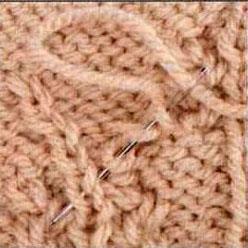 LPT: skip the trace, loop on the left needle, knit the second stitch with the LP, without removing it from the knitting needle, knit the UI of the missed loop and remove both loops from the knitting needle. RPT: skip the trace, the loop on the left needle, knit the second loop of the UI, without removing it from the knitting needle, knit the first loop of the LP and remove both loops from the knitting needle together. Gum-spike (3 p.): 1st row (persons): 1 PI, 1C. 2nd row: 1 PL, BC. Repeat for pattern 1 - and 2 rows. Spit (by 17 points): 1st, 5th, and 7th rows (persons): PL. 2nd and all izn. rows: sp. 3rd row: * 4/4 RC, 1 LP, 4/4 LC. 8th row: SP. Repeat for pattern 1-8th rows. Reverse Spit (by 17 points): 1st, 5th and 7th rows (persons): LP. 2nd and all izn. rows: sp. 3rd rows: 4/4 LC, 1 LP, 4/4 RC. 8th row: SP. Repeat for pattern 1-8th rows. The central panel. Dial 79 p.
1st row (persons): 1 PL, [1 PI, knit gum-spikelet on 3, 2 PI, 4 LP, 4 PI, 1 LP, 4 PI, 4 LP, 1 PI] 3 times, 1 PI, knit gum-spike on 3 p., 1 PI, 1 LP. 2nd row: * 1 PL, [1 PL, knit gum-spike on 3 p., 2 PL, 4 PI, 4 LP, 1 PI, 4 LP, 4 PI, 1 LP] 3 times, 1 PL, knit gum-spike on 3 p., 2 LP. 3-12th rows: repeat 1st and 2nd rows. 13th row: 1 PL, 1 PI, knit gum-spike on 3 p., 2 PI, start with the 1st row backward braid on 17 p., 2 PI, knit gum-cone on 3 p., 2 PI, start with the 1st row braid on 17 p., 2 PI, knit gum-spikelet on 3 p., 2 PI, start with the 1st row backward braid on 17 p., 2 IP, knit gum- spikelet on 3 p., 1 PI, 1 LP. 14th row: 2 PL, knit gum-spikelet on 3 p., 2 PL, knit the 2nd row of the reverse braid on 17 p., 2 PL, knit gum-spikelet on 3 p., 2 PL, knit 2- the second row of the braid is on 17 p., 2 PL, knit the elastic band-spike on 3 p., 2 LP, knit the 2nd row of the back braid on 17 p., 2 LP, knit the elastic band-cone on 3 p., 2 LP. 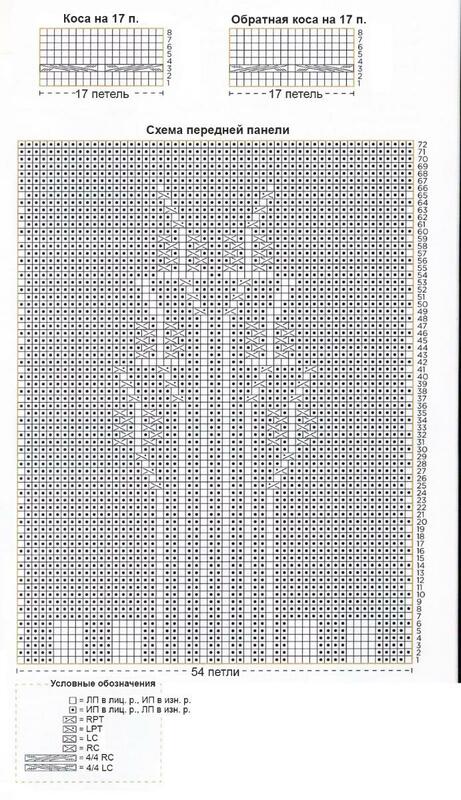 15-210th rows: continue to knit according to the pattern, as established in the 2 previous rows (you need to finish the 4th row of the repeat of the “braid” pattern). 211-222nd rows: repeat the 1-12th rows. Close all loops by drawing. Side panel (2 pcs.). Dial 54 p.
6th rows: 1 PL, [4 LP, 4 PI] 2 times, [2 LP, 1 PI] 6 times, 2 LP, [4 PI, 4 LP] 2 times, 1 LP. 7th row: 1 PL, 16 PI, [2 PI, 1 LP] 6 times, 18 PI, 1 LP. 8th row: 17 PL, [2 LP, 1 PI] 6 times, 19 LP. 9-24th rows: repeat the 7th and 8th rows. 25th row: * 1 PL, 17 PI, RPT, [2 PI, 1 LP] 4 times, 2 PI, LPT, 17 PI, 1 LP. 26th row: 18 PL, 1 PI, 1 LP, [2 LP, 1 PI] 4 times, 3 LP, 1 PI, 18 LP. 27th row: 1 PL, 16 PI, RTD, 1 PI, [2 PI, 1 LP] 4 times, 3 PI, LРТ, 16 PI, 1 LP. 28th row: 17 PL, 1 PI, 2 LP, [2 LP, 1 PI] 4 times, 4 LP, 1 PI, 17 LP. 29th row: 1 PL, 15 PI, RTD, 2 PI, [2 PI, 1 LP] 4 times, 4 PI, LРТ, 15 PI, 1 LP. 30th row: 13 PL, 7 PI, [2 LP, 1 PI] 4 times, 2 LP, 7 PI, 13 LP. 31st, 33rd and 35th rows: 1 PL, 12 PI, gum-spikelet, 1 PL, gum-spikelet, [2 PI, 1 LP] 4 times, 2 PI, gum-split, 1 LP, gum-spike, 12 PI, 1 LP. 32nd and 34th rows: 13 PL, gum-spikelet, 1 PI, gum-spikelet, [2 LP, 1 PI] 4 times, 2 LP, elastic band, 1 PI, gum-spike, 13 LP. 36th row: 16 PL, 1 PI, 3 LP, [2 LP, 1 PI] 4 times, 5 LP, 1 PI, 16 LP. 37th row: 1 PL, 14 PI, RTD, 4 PI, RTT, [2 PI, 1 LP] 2 times, 2 PI, LPT, 4 PI, LPT, 14 PI, 1 LP. 38th row: 15 PL, 1 PI, 5 LP, 1 PI, 1 LP, [2 LP, 1 PI] 2 times, 3 LP, 1 PI, 5 LP, 1 PI, 15 LP. 39th row: 1 PL, 13 PI, RTD, 4 PI, RTT, 1 PI, [2 PI, 1 LP] 2 times, 3 PI, LPT, 4 IP, LPT, 13 IP, 1 LP. 40th row: 14 PL, 1 PI, 5 LP, 1 PI, 2 LP, [2 LP, 1 PI] 2 times, 4 LP, 1 PI, 5 LP, 1 PI, 14 LP. 41st row: 1 PL, 12 PI, RTD, 4 PI, RTT, 2 PI, [2 PI, 1 LP] 2 times, 4 PI, LРТ, 4 PI, LРТ, 12 PI, 1 LP. 42nd row: 16 PL, 7 PI, [2 LP, 1 PI] 2 times, 2 LP, 7 PI, 16 LP. 43rd, 45th and 47th rows: 1 PL, 15 PI, gum-spikelet, 1 LP, gum-spikelet, [2 PI, 1 LP] 2 times, 2 PI, gum-split, 1 LP, gum-spike, 15 IP, 1 LP. 44th and 46th rows: 16 PL, gum-spikelet, 1 PI, gum-spikelet, [2 LP, 1 PI] 2 times, 2 LP, elastic band, 1 PI, gum-spike, 16 LP. 48th row: 19 PL, 1 PI, 3 LP, [2 LP, 1 PI] 2 times, 5 LP, 1 PI, 19 LP. 49th row: 1 LP, 17 PI, RT, 4 PI, RT, 2 PI, LPT, 4 PI, LPT, 17 IP, 1 LP. 50th row: 18 PL, 1 PI, 5 LP, 1 PI, 4 LP, 1 PI, 5 LP, 1 PI, 18 LP. 51st row: 1 PL, 16 PI, [RTD, 4 PI] 2 times, LРТ, 4 PI, LРТ, 16 IP, 1 LP. 52nd row: 17 PL, 1 PI, 5 LP, 1 PI, 6 LP, 1 PI, 5 LP, 1 PI, 17 LP. 53rd row: 1 LP, 15 PI, RT, 4 PI, RT, 6 PI, LPT, 4 PI, LPT, 15 IP, 1 L P.
54th row: 19 PL, 7 PI, 2 LP, 7 PI, 19 LP. 55th, 57th and 59th rows: 1 PL, 18 PI, gum-spikelet, 1 LP, gum-spikelet, 2 PI, gum-spikelet, 1 LP, gum-spike, 18 PI, 1 LP. 56th and 58th rows: 19 PL, gum-spikelet, 1 PI, gum-spikelet, 2 LP, gum-spikelet, 1 PI, gum-spikelet, 19 LP. 60th row: 22 PL, 1 PI, 8 LP, 1 PI, 22 LP. 61th row: 1 PL, 20 PI, RT, 8 PI, LPT, 20 PI, 1 LP. 62nd row: 21 LP, 1 PI, 10 LP, 1 PI, 21 LP. 63rd row: 1 PL, 19 PI, RРТ, 10 PI, LРТ, 19 PI, 1 LP. 64th row: 20 PL, 1 PI, 12 LP, 1 PI, 20 LP. 65th row: 1 PL, 18 PI. RT, 12 PI, LPT, 18 IP, 1 LP. 66th row: 19 PL, 1 PI, 14 LP, 1 PI, 19 LP. 67th, 69th and 71st rows: FE. 68th, 70th and 72nd rows: LP. Close all loops. Build and finish. Divide each side of the central panel into three parts, place the markers. Sew the center panel first to one side of the side panel, moving up, then to the edge with closed loops and to the other side of the side panel, moving down. Repeat on the other side. Embroider spikelets of wheat on each side panel with twisted stitch, placing them on the stalks of elastic bands. Run 2 twisted cord. Sew the ends of the cord around each "sheaf" of "spikelets of wheat."